This entry was posted in Cats Sleep on SFF and tagged Ann VanderMeer, Jeff VanderMeer, P.F. Nel by Mike Glyer. Bookmark the permalink. Tiertjie looks annoyed. Did you interrupt their reading? @Lenore Jones: It looks to me as if Tiertjie was being vigilant against misbehaving time travelers. It looks to me as if Tiertjie was being vigilant against misbehaving time travelers. Tiertjie stands with Schroedinger’s Cat. Or sits, anyway. I’m coming late to this. 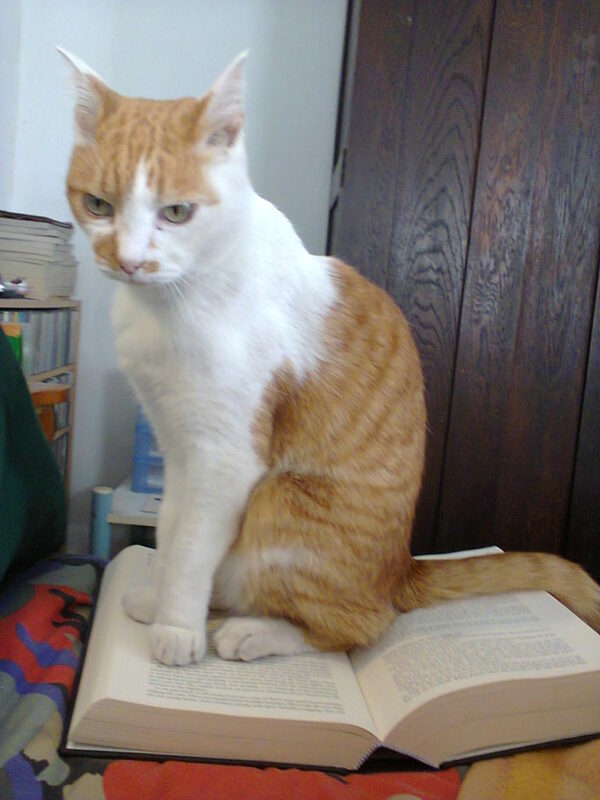 Have you taken photos of cats sitting on genre books about cats? I’m thinking of some books from my long-ago childhood —- Lloyd Alexander’s “Time Cat” about a cat that can travel through time and take a child protagonist with him, and the “Space Cat” books of Ruthven Todd, a Scottish poet, who, when not editing the works of William Blake, wrote chapter books about a who went along with some astronauts as a sort of mascot, with his own space suit and telepathic powers. Scrolling through the numerous posts with the tag is great fun–and shows just how, erm, flexible, the definition of “cat” can be! I can’t believe that we’re up to more than 60 of these posts already — plus a couple more which were included in scrolls and not tagged! @Jim Meadows: I loved those books! I have no idea whether they’d be readable now — they were definitely elementary-school level, and I don’t remember them well enough to say whether they had awkward politics etc. — but they were a lot of fun at the time. Look at his so cute mustache! What a fierce kitteh!